NC State College of Education is the nexus of adult education. As a graduate student, I was both an adult educator and an adult learner. This experience demonstrated how teaching and learning are innately intertwined. It was experiential learning, broadly affirming to me that, in order to be a good adult educator, I must continuously learn. I gained particular insights in theoretical frameworks, leadership knowledge, and research in the field of education that inform my practice. I gained historical, philosophical, and theoretical understandings of community colleges that have grounded my practice. Moreover, as I make a variety of leadership decisions, I reflect on lessons, resources, and colleagues that I engaged during my time at College of Education. This reflection may emerge as a framework for a decision that I must make, a contact or source to inform my practice, or a recollection of a case study or peer professional experience. I think these moments of reflection emerge so often because the College of Education provides a solid grounding in adult education from which to draw as we work in the field. community development and beyond. The expert faculty in the NC State College of Education cultivate students to be college leaders. The best advice to a student is to take advantage of the opportunity to draw from this wellspring of theorists and practitioners. It is an added benefit that NC State partners with educational leaders beyond graduate study and beyond the walls of the university. Even now, we partner with the NCSU College of Education in identifying relevant research and experts, for professional development, and on educational grants and other collaborations. Dr. Stelfanie Williams is the sixth president of Vance-Granville Community College, a four-county, multi-campus college serving over 14,000 students annually. The college operates four campuses across Vance, Granville, Franklin, and Warren counties including four early college high school partnerships and programs in more than forty degree programs, adult and continuing education. Dr. Williams received bachelor’s degrees in Public Policy and Spanish from Duke University, a master’s degree in Project Management from Western Carolina University, and a doctorate in Adult & Higher Education from North Carolina State University. She has served as faculty and in several administrative capacities across her community college career, including director, dean, and vice president. As Vice-President at Central Carolina Community College, Stelfanie led the institution as the first in the state to administer a workforce investment board. Dr. Williams serves on many local, state, and national civic groups, associations, and corporate boards, including Union Bank & Trust Board of Directors, NC New Schools Inc. Board of Directors, and North Carolina Central University School of Business Board of Visitors. She also serves as adjunct faculty for the NCSU College of Education. 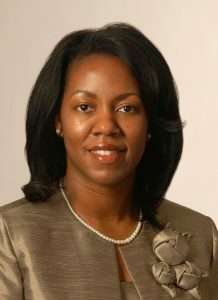 She has presented for numerous national institutes and conferences focused on workforce development and higher education. Among other recognitions, in 2011, Dr. Williams was selected to participate in the White House Regional Community College Summit, and in 2014 she was selected to receive the I.E. Ready Distinguished Leadership Award from NC State University, named in honor of the first president of the North Carolina Community College System, for her active support and engagement in enhancing community colleges in the state.